As a specification, the Java Persistence API is concerned with persistence, which loosely means any mechanism by which Java objects outlive the application process that created them. Not all Java objects need to be persisted, but most applications persist key business objects. The JPA specification lets you define which objects should be persisted, and how those objects should be persisted in your Java applications. By itself, JPA is not a tool or framework; rather, it defines a set of concepts that can be implemented by any tool or framework. While JPA's object-relational mapping (ORM) model was originally based on Hibernate, it has since evolved. Likewise, while JPA was originally intended for use with relational/SQL databases, some JPA implementations have been extended for use with NoSQL datastores. A popular framework that supports JPA with NoSQL is EclipseLink, the reference implementation for JPA 2.2. The Java Persistence API was first released as a subset of the EJB 3.0 specification (JSR 220) in Java EE 5. It has since evolved as its own spec, starting with the release of JPA 2.0 in Java EE 6 (JSR 317). As of this writing, JPA 2.2 has been adopted for continuation as part of Jakarta EE. Because of their intertwined history, Hibernate and JPA are frequently conflated. However, like the Java Servlet specification, JPA has spawned many compatible tools and frameworks; Hibernate is just one of them. Developed by Gavin King and released in early 2002, Hibernate is an ORM library for Java. King developed Hibernate as an alternative to entity beans for persistence. The framework was so popular, and so needed at the time, that many of its ideas were adopted and codified in the first JPA specification. Today, Hibernate ORM is one of the most mature JPA implementations, and still a popular option for ORM in Java. Hibernate ORM 5.3.8 (the current version as of this writing) implements JPA 2.2. Additionally, Hibernate's family of tools has expanded to include popular tools like Hibernate Search, Hibernate Validator, and Hibernate OGM, which supports domain-model persistence for NoSQL. As noted earlier, JPA was introduced as a subset of EJB 3.0, but has since evolved as its own specification. EJB is a specification with a different focus from JPA, and is implemented in an EJB container. Each EJB container includes a persistence layer, which is defined by the JPA specification. While they differ in execution, every JPA implementation provides some kind of ORM layer. In order to understand JPA and JPA-compatible tools, you need to have a good grasp on ORM. Object-relational mapping is a task–one that developers have good reason to avoid doing manually. A framework like Hibernate ORM or EclipseLink codifies that task into a library or framework, an ORM layer. As part of the application architecture, the ORM layer is responsible for managing the conversion of software objects to interact with the tables and columns in a relational database. In Java, the ORM layer converts Java classes and objects so that they can be stored and managed in a relational database. By default, the name of the object being persisted becomes the name of the table, and fields become columns. Once the table is set up, each table row corresponds to an object in the application. Object mapping is configurable, but defaults tend to work well. Until fairly recently, non-relational databases were uncommon curiosities. The NoSQL movement changed all that, and now a variety of NoSQL databases are available to Java developers. Some JPA implementations have evolved to embrace NoSQL, including Hibernate OGM and EclipseLink. Figure 1 illustrates the role of JPA and the ORM layer in application development. When you set up a new project to use JPA, you will need to configure the datastore and JPA provider. You'll configure a datastore connector to connect to your chosen database (SQL or NoSQL). You'll also include and configure the JPA provider, which is a framework such as Hibernate or EclipseLink. While you can configure JPA manually, many developers choose to use Spring's out-of-the-box support. See "JPA installation and setup" below for a demonstration of both manual and Spring-based JPA installation and setup. Java Data Objects is a standardized persistence framework that differs from JPA primarily by supporting persistence logic in the object, and by its longstanding support for working with non-relational data stores. JPA and JDO are similar enough that JDO providers frequently also support JPA. See the Apache JDO Project to the learn more about JDO in relation to other persistence standards like JPA and JDBC. From a programming perspective, the ORM layer is an adapter layer: it adapts the language of object graphs to the language of SQL and relational tables. The ORM layer allows object-oriented developers to build software that persists data without ever leaving the object-oriented paradigm. When you use JPA, you create a map from the datastore to your application's data model objects. Instead of defining how objects are saved and retrieved, you define the mapping between objects and your database, then invoke JPA to persist them. If you're using a relational database, much of the actual connection between your application code and the database will then be handled by JDBC, the Java Database Connectivity API. As a spec, JPA provides metadata annotations, which you use to define the mapping between objects and the database. Each JPA implementation provides its own engine for JPA annotations. The JPA spec also provides the PersistanceManager or EntityManager, which are the key points of contact with the JPA system (wherein your business logic code tells the system what to do with the mapped objects). To make all of this more concrete, consider Listing 1, which is a simple data class for modeling a musician. The Musician class in Listing 1 is used to hold data. It can contain primitive data such as the name field. It can also hold relations to other classes such as mainInstrument and performances. Musician's reason for being is to contain data. This type of class is sometimes known as a DTO, or data transfer object. DTOs are a common feature of software development. While they hold many kinds of data, they do not contain any business logic. Persisting data objects is a ubiquitous challenge in software development. One way to save an instance of the Musician class to a relational database would be to use the JDBC library. 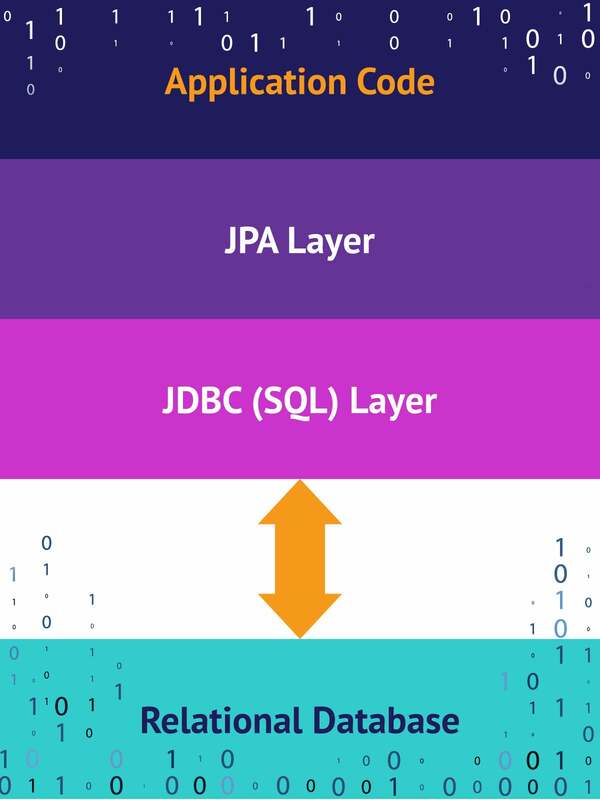 JDBC is a layer of abstraction that lets an application issue SQL commands without thinking about the underlying database implementation. Listing 2 shows how you could persist the Musician class using JDBC. While JDBC allows the control that comes with manual configuration, it is cumbersome compared to JPA. In order to modify the database, you first need to create an SQL query that maps from your Java object to the tables in a relational database. You then have to modify the SQL whenever an object signature change. With JDBC, maintaining the SQL becomes a task in itself. Now consider Listing 3, where we persist the Musician class using JPA. Listing 3 replaces the manual SQL from Listing 2 with a single line, session.save(), which instructs JPA to persist the object. From then on, the SQL conversion is handled by the framework, so you never have to leave the object-oriented paradigm. The magic in Listing 3 is the result of a configuration, which is created using JPA's annotations. Developers use annotations to inform JPA which objects should be persisted, and how they should be persisted. Listing 4 shows the Musician class with a single JPA annotation. Persistent objects are sometimes called entities. Attaching @Entity to a class like Musician informs JPA that this class and its objects should be persisted. JPA also supports using external XML files, instead of annotations, to define class metadata. But why would you do that to yourself? Like most modern frameworks, JPA embraces coding by convention (also known as convention over configuration), in which the framework provides a default configuration based on industry best practices. As one example, a class named Musician would be mapped by default to a database table called Musician. The conventional configuration is a timesaver, and in many cases it works well enough. It is also possible to customize your JPA configuration. As an example, you could use JPA's @Table annotation to specify the table where the Musician class should be stored. Listing 5 tells JPA to persist the entity (Musician class) to the musician table. In JPA, the primary key is the field used to uniquely identify each object in the database. The primary key is useful for referencing and relating objects to other entities. Whenever you store an object in a table, you will also specify the field to use as its primary key. In Listing 6, we tell JPA what field to use as Musician's primary key. In this case, we've used JPA's @Id annotation to specify the id field as Musician's primary key. By default, this configuration assumes the primary key will be set by the database--for instance, when the field is set to auto-increment on the table. JPA supports other strategies for generating an object's primary key. It also has annotations for changing individual field names. In general, JPA is flexible enough to adapt to any persistence mapping you might need. Once you've mapped a class to a database table and established its primary key, you have everything you need to create, retrieve, delete, and update that class in the database. Calling session.save() will create or update the specified class, depending on whether the primary-key field is null or applies to en existing entity. Calling entityManager.remove() will delete the specified class. Each type of relationship describes how an entity relates to other entities. For example, the Musician entity could have a one-to-many relationship with Performance, an entity represented by a collection such as List or Set. If Musician included a BandMates field, that could represent a many-to-many relationship with other Musician entities. Finally, Musician might have a one-to-one relationship with a Quote entity, used to represent a famous quote: Quote famousQuote = new Quote(). JPA has annotations for each of of its relationship mapping types. Listing 7 shows how you might annotate the one-to-many relationship between Musician and Performances. One thing to notice is that the @JoinColumn tells JPA what column on the Performance table will map to the Musician entity. Each performance will be associated to a single Musician, which is tracked by this column. When JPA loads a Musician or a Performance into the database, it will use this information to reconstitute the object graph. In addition to knowing where to place related entities in the database, JPA needs to know how you want them loaded. Fetching strategies tell JPA how to load related entities. When loading and saving objects, a JPA framework must provide the ability to finetune how object graphs are handled. For instance, if the Musician class has a bandMate field (as shown in Listing 7), loading george could cause the entire Musician table to be loaded from the database! While outside the scope of this short introduction, transactions allow the developer to write to the database. In Listing 1, we achieved a simple transaction with the line: em.getTransaction().commit();. Transactions can be defined in a variety of ways, from explicit interactions via the API, to using annotations to define transactional boundaries, to using Spring AOP to define transactions. We'll conclude with a quick look at installing and setting up JPA for your Java applications. For this demonstration I'll use EclipseLink, the JPA reference implementation. The common way to install JPA is to include a JPA provider into your project. Listing 8 shows how you would include EclipseLink as a dependency in your Maven pom.xml file. You will also need to include the driver for your database, as shown in Listing 9. Next, you'll need to tell the system about your database and provider. This is done in the persistence.xml file, as shown in Listing 10. There are other ways to provide this information to the system, including programmatically. I recommend using the persistence.xml file because storing dependencies this way makes it very easy to update your application without modifying code. Using Spring will greatly ease the integration of JPA into your application. As an example, placing the @SpringBootApplication annotation in your application header instructs Spring to automatically scan for classes and inject the EntityManager as required, based on the configuration you've specified. Listing 11 shows the dependencies to include if you want Spring's JPA support for your application. Every application that deals with a database should define an application layer whose sole purpose is to isolate persistence code. As you've seen in this article, the Java Persistence API introduces a range of capabilities and support for Java object persistence. Simple applications may not require all of JPA's capabilities, and in some cases the overhead of configuring the framework may not be merited. As an application grows, however, JPA's structure and encapsulation really earn their keep. Using JPA keeps your object code simple and provides a conventional framework for accessing data in Java applications.